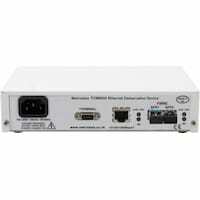 The FCM9000 Ethernet Demarcation Device is a Carrier Ethernet Service delivery unit, offering end to end management using 802.3ah and 802.1ag OAM, delivering 10/100/1000BaseT copper and 100Base/1000Base-X fibre Ethernet services via fibre infrastructures. The FCM9000 has been superceeded by our new Ethernet Demarcation Device range (also known as Network Interface Devices, or 'NIDs'): FCM9003 Ethernet Access Device, and the Advanced FCM9005 Ethernet Demarcation Device products, full details of which can be found under the Managed Carrier Ethernet Service Demarcation product menu. The FCM9000 is a highly manageable Ethernet Demarcation Device (EDD) offering 10/100/1000Base copper & fibre Ethernet demarcation and service delivery via fibre infrastructure. Carrier Ethernet OAM functionality means that customer service levels can be assured. The FCM9000 supports 802.3ah Link OAM (EFM) and 802.1ag Service OAM Connectivity Fault Management (CFM) which means that the Ethernet service can be managed and monitored right up to the customer delivery point. The development roadmap includes support for IEEE802.3ad with LACP. The Service Provider’s management traffic can be isolated using a dedicated S-Tag or C-Tag defined span VLAN. In line with all other members of the MetroCONNECT Ethernet Service Delivery family, the FCM9000 supports Zero Touch Provisioning, minimising both on-site installation time and the Engineering skills required. Our unique ‘IP proxy over OAM’ functionality reduces on-site installation to a ‘plug and play’ exercise, simply checking that Ethernet link-up LEDs indicate correct physical connectivity. Comprehensive Telnet and/or SNMP remote management is available to the device via an IP proxy process across Layer-2 OAM traffic from an MC12000 Service Delivery chassis or another MetroCONNECT family device at the network centre, with no need for layer-3 (IP) parameters to be assigned locally. If required, individual configuration can be subsequently downloaded via TFTP. The FCM9000 operates in store and forward mode and supports RSTP and the transmission of 10k byte Jumbo frames. The FCM9000 supports auto-negotiation and auto MDI/MDIX cross-over switching on the copper interface. To ensure quick fault isolation, the FCM9000 supports Link Loss Forwarding, whereby a network fault will automatically force a link down on the user port to indicate to the attached device that there is a link problem. The FCM9000 is available in a choice of 100-250V AC or -40V DC integrated power supplies, although a 12V-24V DC version is also available on request. 19” rack mounting units are available. The FCM9000 can easily be rack mounted in either a 1U two unit rack mount kit, a 6U eighteen unit rack mount kit. This application shows an MC12000 with FCC9000 twin Ethernet modules, supporting multiple FCM9000 Ethernet Demarcation Devices (or EDD's, otherwise known as Network Interface Devices or NID's). The MetroCONNECT and FCM9000 together offer interface conversion and Ethernet demarcation, with remote management via 802.3ah OAM. Various service delivery options are available including fibre to copper, fibre to fibre and resilient fibre to copper. Comprehensive remote network management access is available via the MetroCONNECT including end to end remote management using 802.3ah OAM. 10M, 100M and Gigabit Ethernet applications can all be supported, as can Jumbo frames. This application shows an FCM9000 unit being used as the Ethernet demarcation device to deliver a Carrier Ethernet service from an MPLS core network. Offering a resilient SFP uplink means that the FCM9000 can support either single or resilient service delivery topologies, service delivery using multimode or singlemode fibre or 1000baseT copper, as well as a variety of wavelengths including 850nm, 1300nm, 1550nm, CWDM and bi-directional. OAM support means that the FCM9000 can be remotely managed by the central network management system using standards based OAM packets. This application shows how a pair of FCM9000 units can be used to offer Ethernet service demarcation and media conversion functionality either over a fibre (or resilient fibre) or a Carrier Ethernet service.